Are you tired of Googling big bubble recipes only to be disappointed? Me too. 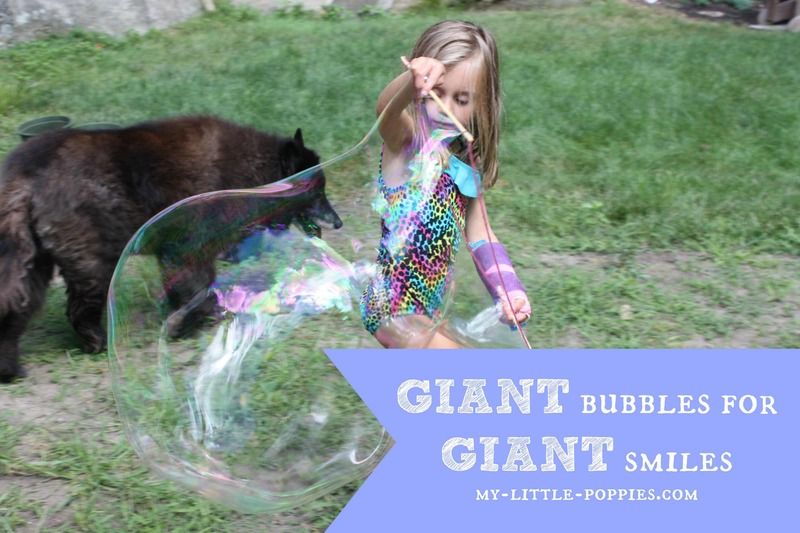 Today, I am sharing our favorite giant bubble recipe and I promise you that it works. Not only that, but it is good, clean, cheap fun. Your kids will have huge smiles and I guarantee you’ll want to get in on the fun, too! 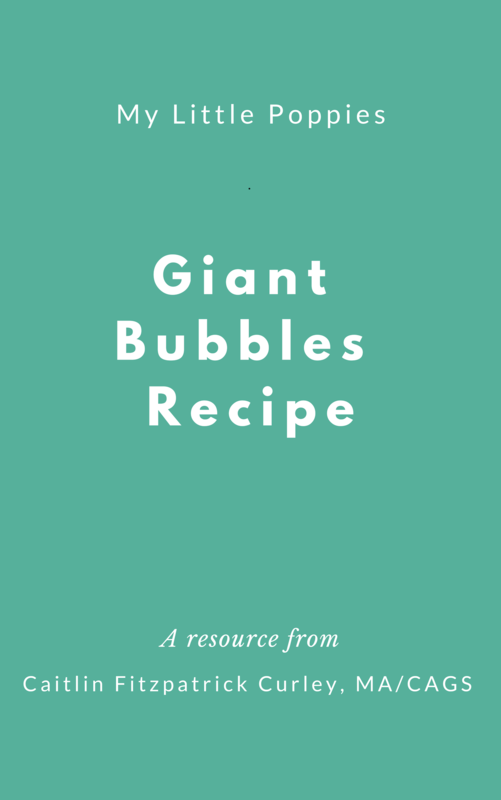 We have been having oodles and oodles of fun with this fantastic and super-easy-to-make Giant Bubble recipe. I would like to thank Mrs. H, Leo’s beloved teacher, for sharing the recipe with us. 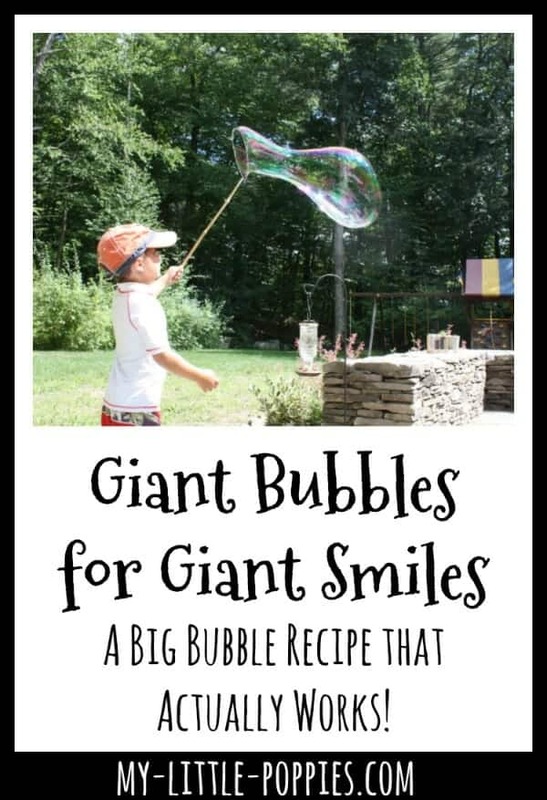 This Giant Bubble recipe creates GIANT smiles for people of all ages. Put simply, these bubbles spread joy. Today, I would like to continue to spread GIANT smiles by sharing the recipe with you! 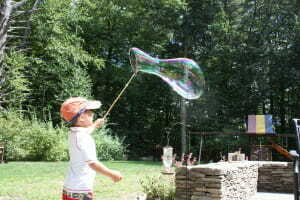 Want to see our GIANT bubbles in action? Honestly, the hardest part was finding guar gum powder, citric acid, and Dawn Ultra. 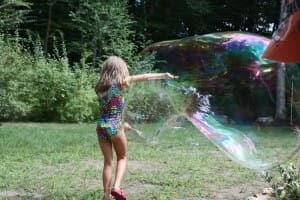 I ended up borrowing some from Mrs. H and then buying our own off of Amazon because I know that GIANT bubbles will be a regular event in our house! Mix the guar gum powder, rubbing alcohol, baking soda, and citric acid together. Make sure you mix it very well. It will become thick like cement. Add the water to the mixture. Make sure that the water is VERY WARM. Stir until dissolved. Add the Dawn Ultra and stir until dissolved. It is worth noting that it took each of my kiddos a couple of minutes to get the feel for making these bubbles. You have to make sure your wand is thoroughly doused in bubble juice, and you have to move slowly. 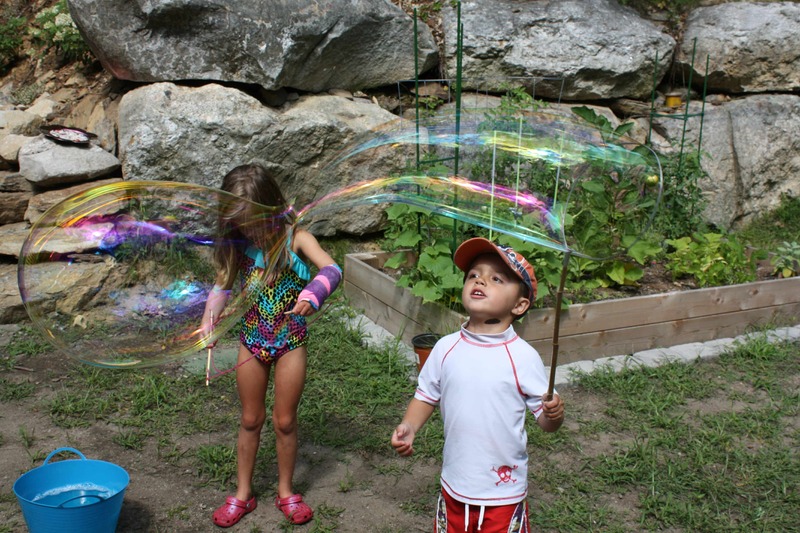 After a few minutes of experimentation, we were off and the bubbles were flying! And get a FREE Giant Bubbles recipe! Get your Giant Bubbles here! We have made this bubble recipe half a dozen times already (yes, we are obsessed), and we’ve also made at least a half-dozen wands. 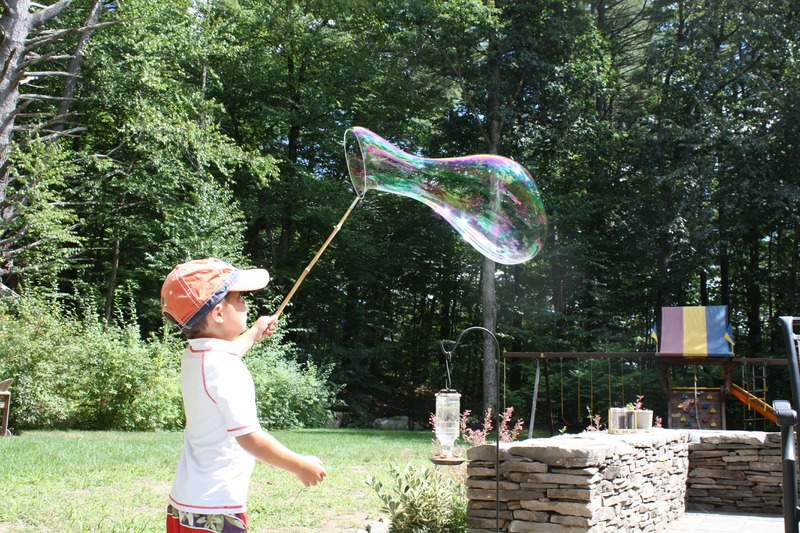 You need only to search Pinterest to find super-simple instructions for giant bubble wands. The Ambassador of Joy himself, spreading joy in the form of GIANT bubbles! It worked perfectly for our almost 4-year-old, who struggled to manipulate some of the other wands we made. 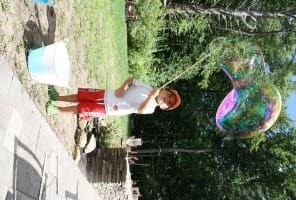 We also made a bubble wand out of two used paint stirrers and some yarn. Alas, it was used so much that we had to toss it. 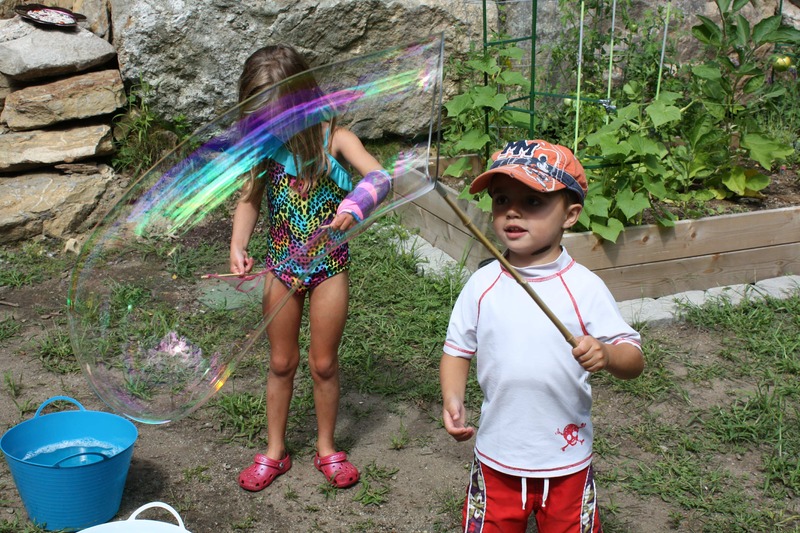 We have enjoyed these bubbles so much that we eventually decided to purchase GIANT bubble wands for a family beach party. The GIANT wands were a GIANT hit, much like the bubbles themselves. This is the wand we purchased and loved. Now, it’s your turn. Tell me: Have you tried GIANT bubbles? Did they give you a GIANT smile? Share your stories here, I love hearing from you! Yay for fun with bubbles!!! Looks like everyone had a blast. Now for me to find Guar Gum… Thanks for sharing! ? What fun! My children would have a blast! Hi Caitlin! Do these bubbles store well? Can I make some in advance or do I need to mix a new batch every time? Yes! I usually quadruple the recipe and store it in a big rubbermaid container. As long as I keep that top on, it lasts!! Do you know if this would work with another dish soap please? We don’t have Dawn brand here in London and its costs about £15 for a small bottle to have it imported. I’ve seen other recipes calling for Joy, but I have never tried it myself! My first batch didn’t make bubbles, but I experimented and the second batch turned out fantastically. For the first batch, I had done two things that were slightly different than the recipe. 1) I used the generic store-brand version of Dawn Ultra, so for the second batch, I used the actual Dawn Ultra. 2) The other different thing was how I combined the ingredients. The first time, I thought it would be good to mix a half cup of the water into the dry ingredients to make a slurry before adding the rest of the water. Nope! When I mixed a little water into the dry ingredients, it formed a jello-like substance, and then that didn’t mix into the rest of the water. There were small blobs of goo floating in the water at the end. For the second batch, I used namebrand Dawn Ultra and I mixed four cups of hot water all at once with the dry ingredients and then added the rest of the water. I don’t know if the problem was the brand of detergent or how I mixed it or both. Second batch following the recipe more exactly came out great! Huuuuuuge bubbles. So glad it came out well for you, Mary!